How To Coordinate Ottomans With Your Room Decor? An Ottoman is probably one of the most versatile and stylish pieces of furniture, in Western culture that has also been one of the most underrated. In home and office furnishings, this one item can add a new zing to your old décor and seamlessly fuse in various elements of interior decoration. Depending on the color, texture, fabric and material used for the ottoman, the correct positioning, a little bit of coordination and design can lift up the overall spirit and rejuvenate the theme of your living room, bed room or drawing room. If you are planning to renovate your house but doesn’t want to spend a lot, try ottomans in various shapes and designs. They will certainly be a remarkable way to give your interior a class apart look without being heavy on the pocket. The first thing that must be kept in mind while placing an ottoman in the room is the size of the ottoman. Usually, this must be well suited for the theme of the room. If it’s a living room, the ottoman can double up as a coffee table and hence, must be lesser in height compared to the rest of the furniture. Usually, high heeled ottomans create an air of discomfort in the room and must be avoided. Depending upon the fabric, ottomans are available in a variety of colors, ranging from deep chocolate brown and grey of leather to faux fur and even animal printed upholsteries! The color of the ottoman can add a new dimension to your room. However, the general mood of the room must be taken into consideration while selecting the right ottoman. For instance, a very colorful room can find a perfect balance through more grounded, subtle and monochromatic ottomans which can help maintain the harmony in the room. The versatility of ottomans is further enhanced by the fact that they can act as storage units for a variety of small and big items, like toys, magazines, coffee sets, blankets and even cushions! Set it in the middle of your drawing room and use the ottoman as a coffee table, a couch, a table top, a mini book case and what not! The fact that you can actually play with the ottoman to fit into any purpose in any room of your house gives it an edge that other pieces of furniture lack. Depending on the color and décor of your room, you can go for various shapes and styles of ottomans. Round ottomans, for example are best suited for more rounded furniture in the room, while large and rectangular ottomans with distinctive colors can create magic in longish L-shaped rooms. Create a cluster of small ottomans in the middle of a large, spacious room and witness the effects on the rest of the décor. Ottomans are simply too much fun to play around with! Finally, you can give your room a dramatic effect by making the ottoman the centre of attention in the entire room, by picking up an ottoman which has a contrasting color or shape, that sets it apart from all the other furnishings in the room and provides an artistic appeal to the eyes. 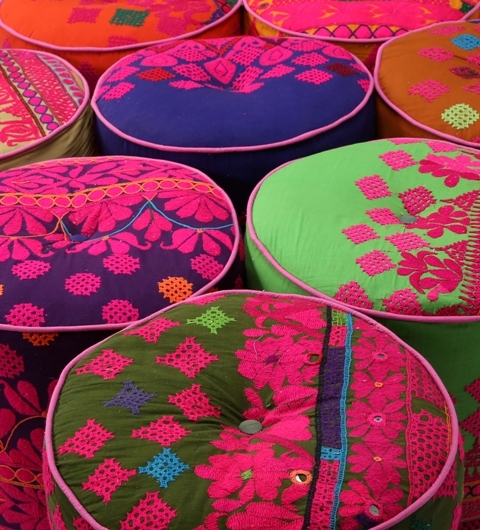 To get a good view of traditional ottomans, you can try online stores like rajrang.com. 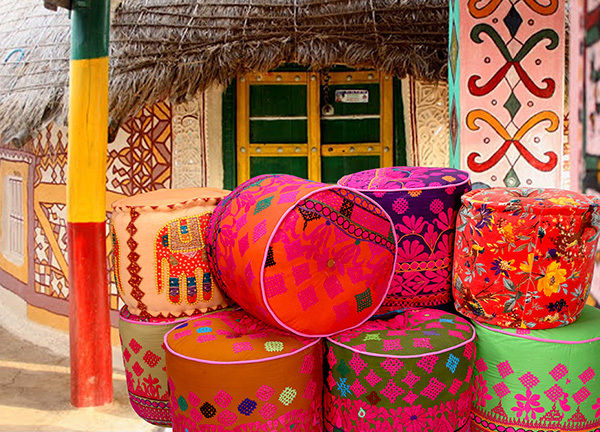 The bright colors, alluring patterns and dramatic combinations at these stores will definitely give you more ideas to infuse these multi-utility décor pieces into your interior. Akshi is an interior designer and a part time blogger, she works with Rajrang. She loves to write about home decoration, interior designing, ladies apparels and accessories.